On Friday, September 24, The Zicklin School of Business at Baruch College hosted 4 of the bright lights from the consulting world. 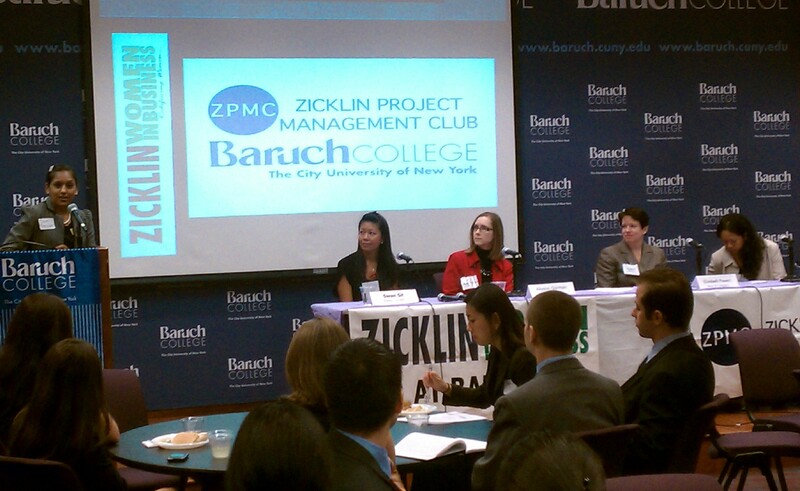 Zicklin Women in Business (ZWIB) and the Zicklin Project Management Club (ZPMC) co-hosted a luncheon with them. Swan Sit of Estee Lauder (and formerly at Bain & Co), Allyson Gorman of Deloitte, Elizabeth Powers of Booz & Company and Tess Mateo of CxCatalyst enjoyed a light lunch and shared their experiences and opinions with the attendees. The most interesting question came from the audience. “What do you [the panelists] recommend to Zicklin students (or others who are not from an elite school) who are interested in a career in consulting. ” Panelists represented Columbia, Wharton and Harvard, so the responses caught my ear. The honest response is that a prospect needs to network. Many consulting firms do not actively recruit at Zicklin, so a prospect will need to meet someone in a consulting firm. One can always apply through websites, but your resume will be on a pile along with all the others. You need some way to stand out. Don’t forget that working for a smaller, niche firm may give you more eclectic experience than what you will find at a big one. The interview process will use case-based exercises, so come prepared. As always, your resume should not have any typos or grammatical errors. You should know yourself and especially your weaknesses. Be able to talk about them and how you mitigate or work around where you fall short. No one is perfect; so you should be articulate about yourself and where you need to improve. Ms. Norman spoke directly to the women in the audience about her experiences and mentors. They don’t have to be women. Men make important mentors too. Ms. Mateo pointed out that mentors are great, but you really need a sponsor. This month’s issue of Harvard Business Review articulates this exact point in Why Men Still Get More Promotions Than Women. In short, a sponsor will actively work to open doors and introduce you. You will find more highlights from the discussion below. One might call them typical women’s issues. However, it is the opinion of your correspondent that “women’s” issues are people issues. You will find relevance to your career no matter who you are. I did. Ask for what you want. (and do it in three’s, as in three people ) If it’s a particular position, a new chair, flexible work arrangements or simply a due date that meets your schedule, ask for it. Don’t be shy. You will be respected for speaking up. Keep up with crowd-sourced development. It’s where the future is. Be true to yourself. Ms. Powers discussed the intersection of her beliefs and her company. You must keep who you are front and center. Draw on your network. They will help you in every step of your career and life. Ms. Sit shared how she gained local knowledge in China in part from her own background and importantly from her network. Start now, while in school. Train yourself to think differently; especially in b-school. Take every chance to learn something new. Learn how to coalesce different thoughts and opinions in a room into one coherent idea. Many thanks to the panelists for their time and honest dialogue. It was such a pleasure. Great job ZWIB & ZPMC. Keep up the great programs. ← The Weekly Carl Aylman!